Hi. Friends, here we are giving CA Toppers Interview of various years. This CA Toppers Interview will help you to prepare exams and this CA Nov 2017 Toppers Interview will you to get knowledge about how to study and how to face exams. This CA Toppers Interview also tells you how they become toppers. So don’t miss to read this CA Toppers Interview. CA Final Dec 2017 result will be announced on 28th Jan 2018. You can check latest CA Topper interviews below. Local boy Sanjay Nawandhar has secured first position in the all-India Chartered Accountant Final exam held in May 2014 by the Institute of Chartered Accountants of India (ICAI). “I was sure of my top position in the exam as I had earlier secured 6th and second place in the first and second stages of this exam. I hope to work in the corporate finance sector. I want to work initially in Mumbai, though ultimately I want to work abroad,” said Nawandhar. Nawandhar’s father is a manager in a cold storage plant. Nawandhar completed his schooling from DAV School in Vaishali Nagar and completed his graduation last year from Rajasthan University. His elder sister, who is also a chartered accountant, inspired him to excel in the finance sector. 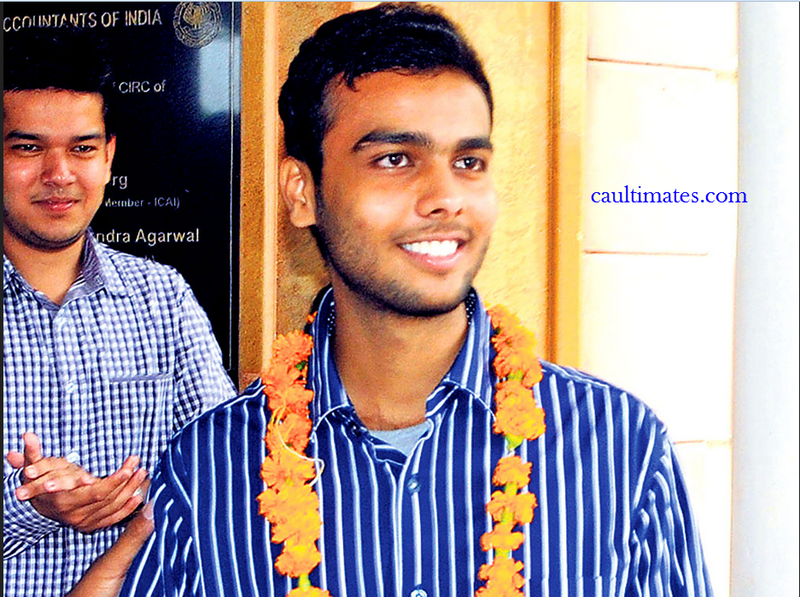 All seven students from ICAI’s Jaipur chapter secured places in the top 50 slots in the all-India examination. 1. Were you always a topper throughout school, college etc. Yes, i was topper in 10th & 12th class. I also secured AIR 23 in CA IPCC. 2. Were you expecting this score or do you think you deserve more. When Honorable president of ICAI CA Subodh Agrawal called me at 10.45AM and said “aap pure bharat me pehle aaye ho”, i initially thought it was a prank. But when I checked on website, news was confirmed. I was expecting rank in top 10. but AIR 1, i never imagined in my weirdest dream. 3. People say Rankers are Nerds who are away from social life. Do you spend enough time with friends etc? I never studied on Sunday. I use to study hard for 6 days & party harder on sunday. Surely I’m not a book worm. I am a big fan of cricket. except one match of ind vs aus on 30.10.2013, i never missed any match of India At VCA Stadium Nagpur. 4. What subjects were difficult for you while studying. 5. What are your future plans. Are you gonna take a Job or Practice.Specify the field. I am very much interested in the field of taxation. I will go for a job in the field of taxation. 6. People that Inspire you. My Mom & Dad are real source of inspiration. My true idol is Sachin Tendulkar. He is so humble after enjoying god like status. 7. What made you take up CA. Is it pre-planned when you were in +2. Please tell us the exact reason. I was supposed to become an Engineer. But after 12th i was unable to secure good marks in competitive exam. I was very frustrated. I made a total diversion to commerce field & i am very happy for my decision. 8. Have you received any calls from Companies offering job since yesterday? Yes i got offers from many corporates. but i m not in any sort of hurry. I just wanted to enjoy this moment. 9. Did you clear all your exams, CPT, IPCC and Final in First attempt? Yes i cleared all my CA exams in 1st attempt. I am very thankful to my parents for their unconditional support, my friends (especially Gaurav Murarka), my family members, my teachers for their blessings & aashirwad. “Chase your dreams, dreams do come true” !!!! “sapne dekho aur mehnat karo, aapka har sapna pura honga” !! thanks a lot for your love & adulation. First of all many congratulations to you, Kruti. So how are you feeling now after getting 1st rank in CA Final. Amazing, feeling like top of the world. Ok nice!! So, what was your first reaction? It was very difficult to believe initially. Then I checked the site again and saw that I have cleared it with a rank. I was at home only with my family and shared the moment with them, the first person I told this is my mother. So, how important is this for you? It is the biggest achievement. Nothing can be better than this. It’s the biggest milestone that I have ever dreamed to cross. Now expectations from everywhere must be high. Who guided you in this whole journey and anyone who inspired you? Everyone- all my teachers and my tutorials, my seniors at my workplace and everyone use to guide me in this whole journey. Any special name you would like to mention or you would like to thank? I would definitely thank all my teachers and specially my principal. My family was the one who motivated me. They have always inspired me to work hard and were very supportive. So, Kruti, how you have achieved this? What was your schedule, time-table and strategy? Actually, I used to go to the library early morning at 8 o’clock and I used to study till 11 and I used to take a small break, just to keep myself fresh. I have prepared in such a manner that I could get time to revise two times at-least before the day of examination. So, I have planned in such a manner that I could revise and be prepared with all the things before the exams. I never used to count how many number of hours I have spent in a day on study, I used to keep on studying unless I am tired. It must be varying from day to day according to your mood!! Would you suggest some tips on how to prepare for the exams and how to attempt for the exams for your juniors? Definitely, I would just tell them that never be afraid of whatever is there in the paper. Everything is possible. Even if it is difficult, you can patiently and calmly try and put all your efforts and you will definitely be able to crack it. Panic is something which many times cleans away whatever is there in our mind. And we definitely have mock-test so we can get a glimpse of how to appear in the final exam. So, I would recommend everyone to have mock-test before appearing for the exams. What is the importance of Articleship, how it fits in the exam? It definitely does help you in subjects like DT, IDT comes, Articleship comes to a great rescue; like when you do it practically, you get to know more things, you get interest in it. I actually, used to love studying DT, IDT books because we had some practical knowledge, like how actually does the thing happen and studying that one was a great fun. So one should take his/her articleship very seriously, seniors also comes as a great help and guide you in exams. So, what are you saying is that one should give good number of mock tests before appearing for examination? Not much but atleast if possible, once or twice; so that one can have an idea of in 3 hours how to write a paper, whether you are able to complete and what kind of paper pattern is that. Actually, I got to learn many things from the mock test. Any hurdles you have faced in this whole journey, you would like to share with us? Whatever challenges were there, all my friends, my family was always there to support me. It wasn’t difficult to come out of it. I think I am blessed for having such a great family as well as friends and teachers around me. So, what is your next plan after this? Actually, I am planning to do LLB. That’s really interesting because in the past we have interacted with previous toppers but none of them have showed their interest in Law after CA. Ya, I have already applied at GLC, Mumbai. Have not planned yet that what I will do after that, may be will go in corporate law or something but right now I am concentrating on law. Interesting!! Rank No. 1 and Rank No. 2, both are from Mumbai so how does it feel? It feels great when we see that Mumbai is having toppers and we can prove that Mumbai students are bright. Usually, it is from Chennai or from somewhere else we feel that ranks will come from there, but from past 2 years it’s from Mumbai so we feel great. So, do you have any message for the aspiring CA students? Just do your best and leave the rest for God to decide. He will definitely give you what you what you want. Thanks a lot Kruti for your time, now we would wish you for the celebrations. Once again congratulations and all the best for your future! Sakshi Gupta topper of IPCC May 2013 CA exams and a 2nd year B.Com student of Narsee Moonjee College of Commerce, Mumbai shares tips to crack the exam. She has also secured 9th Rank in Common Proficiency Test (CPT) of CA and secured 98% in Class X CBSE Exam. How did you prepare for the CA exam? Was it difficult to manage studies and college together? Reading books, watching cartoons, movies and traveling. What was the reaction of your parents when they came to know that you topped the exam? My parents were sure that I would get good marks but getting first rank was out of imagination. So when heard the news from Institute of my topping, they were elated and were on the top of the world. Their happiness is still to sink in. My younger brother is studying in Class VIII. My first aim is to become CA like my father and then I would like to go from MBA from a top 10 MBA college. I would like to thank my teachers at college and JK Shah Classes who have helped me a lot in every stage of preparation. I also like to inform you that this feat would not have been possible with support of my mother who has also worked hard with me for my preparation. What advice would you give to students interested in pursuing CA? Be focused and thoroughly read Study Modules issued by Institute and regular study helps a lot. A few reference books will also help.